Another practice puzzle for the GP. Rules Fill the grid with numbers from 1 to 6 such that every row and column contains all numbers. 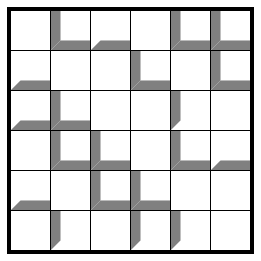 The numbers represent skyscrapers of the given height. There is a gray shadow at the south edge of a cell if some skyscraper further south in that column would throw a shadow onto the roof of the skyscraper in that cell, with the sun shining at a 45º angle. Similarly, a shadow on the west edge corresponds to sunshine from the west. This entry was posted in Puzzles and tagged afternoon skyscrapers, medium, practice, skyscrapers, variant on 2014-03-26 by rob.